The National Key Deer Refuge (NKDR) is situated in the Big Pine Key Florida area and covers 9,700 acres of land. This safe haven was formed in 1957 in an attempt to prevent the extinction of the area's tiny deer who are unique to the Florida Keys. The largest percentage of the NKDR is on Big Pine Key and No Name Key. Currently there are approximately 800 of these tiny Florida deer. This is a substantial improvement over their all time low of 27 in the herd when the NKDR was first established. 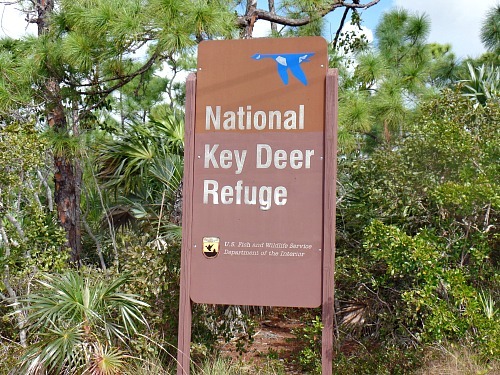 The National Key Deer Refuge Visitor Center is located a few blocks north of the traffic light on US Highway 1 at Mile Marker 30, and is at 179 Key Deer Blvd in the Big Pine Key Shopping Plaza. The phone number for the Visitor Center is 305-872-2239. The headquarters are located at 28950 Watson Boulevard, Big Pine Key, and the phone number there is 305-872-0774. Since the water around the Florida Keys is shallow, and the tiny deer are good swimmers, they live on about 30 different islands which provide them with a wide range of habitat. The land includes tropical hardwood hammocks, saltwater and freshwater marshes, mangroves and the pine rocklands. 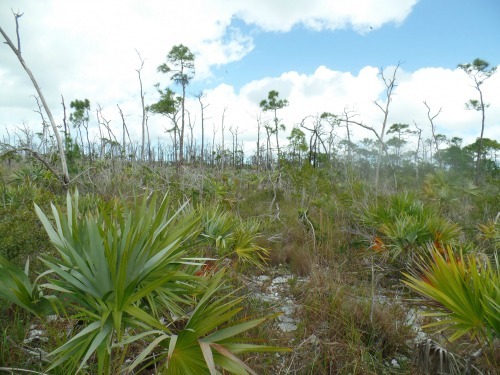 The diverse vegetation which includes slash pine, silver and thatch palms, orchids, and poisonwood helps to provide a suitable environment for 17 other threatened and endangered species in the region, including the Lower Keys marsh rabbit and the Eastern diamond back rattlesnake. Having an opportunity to view these amazingly small animals in their natural environment is well worth the stop. Not only will you be able to watch them eating, sleeping and even playing, you'll be able to view a number of other animal species. The wetlands that are adjacent to the trails provide opportunity to view a variety of migratory birds, native birds, and wading birds. You can also expect to see turtle, alligator, fish and of course watch for snake. You may also spot other smaller mammals so make sure you have your binoculars and a camera handy. 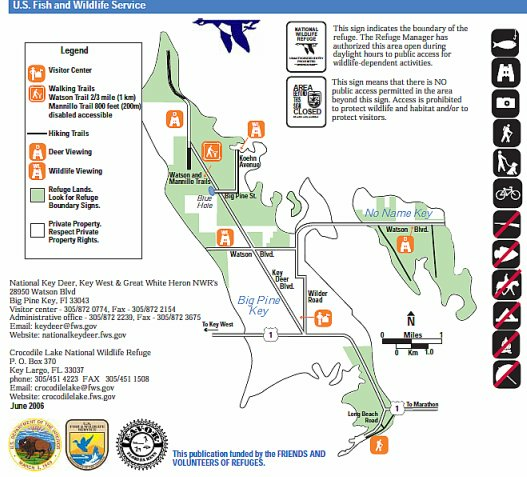 This brochure from the Department of the Interior, Fish & Wildlife Service has a map of the National Key Deer Refuge hiking trails on Page 1. On Page 2 it provides descriptive information on the key deer and important tips on things to avoid to help safeguard these tiny creatures. Plus if you're an avid hiker don't miss out on enjoying the other Florida Keys hiking trails in the area. The first stop is the Blue Hole which is a limestone quarry made when Henry Flagler built his railroad. Since this is not a natural formation it depends on rain and the saltwater that flows through it to provide a water habitat for the turtle, fish, alligator and birds that rely on it. When you leave the Blue Hole you'll travel a few blocks north on Key Deer Blvd to the Jack Watson Wildlife Trail. This trail and the Fred Manillo Wildlife Trail, are accessible via the parking lot located here. 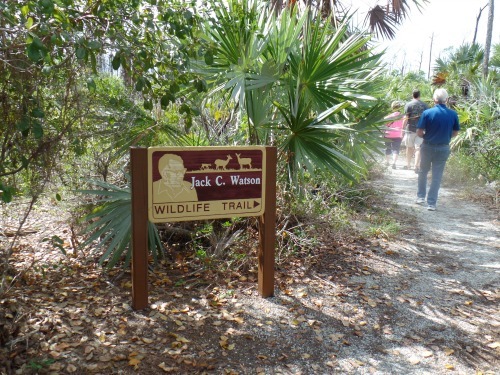 The Jack Watson Wildlife Trail is a two-third of a mile hike that loops through the pine rocklands and the freshwater wetlands. This provides good viewing opportunities for a variety of bird species as well as Florida key deer. It also gives you a chance to enjoy some of the varied vegetation this sub-tropical area is known for. After the Jack Watson Wildlife Trail you'll want to spend some time on the viewing platform at the Fred Manillo Wildlife Trail. This is an 800' wheelchair accessible platform that provides a good overview of the freshwater wetlands. On any given day at the National Key Deer Refuge, a visit to this platform should produce excellent bird watching, especially if you're quiet and patient. 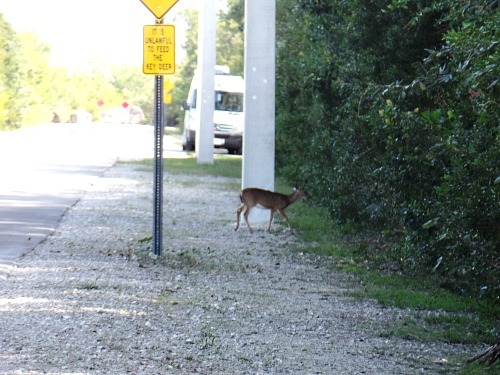 As with any other of the National Wildlife Refuges, it's illegal to feed the wildlife at the National Key Deer Refuge. Unfortunately due to the cute friendliness of the tiny deer, people often confuse them for pets. The worst thing a human can do is to treat these animals as such by feeding them. This action eliminates their fear of mankind, and brings them into continually closer contact with us and our animals. Being small in stature means they can easily be hurt or killed by dogs. Each year several deaths are attributed to dogs running loose who attack and kill a deer. Feeding also brings them closer to vehicles and roadsides and unfortunately, vehicles are the number one killer of these gentle creatures. Feeding also causes them to gather in larger groups which gives any disease an opportunistic foothold to spread throughout the whole herd. Of course, last but not least, what humans feed them is certainly not always healthy or natural. They've been seen eating hot dogs, gum, candy and all sorts of other "non food groups". By filling them up with an unnatural diet, it's harder for them to get the proper nutrients they require to maintain their health. This area is overseen by administrative offices that manage the other three Refuges in the area. 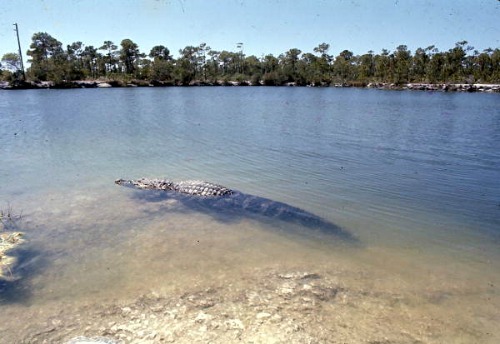 These include the Crocodile Lake NWR, the Great White Heron NWR, and the Key West National Wildlife Refuge. However, unlike the latter two, this protected area is primarily open to the public and there are different trails and self interpretative areas that can be enjoyed. No Florida Keys vacation would be complete without spending at least a few hours on Big Pine Key at the National Key Deer Refuge. You'll be completely surprised by how small these Florida deer actually are. Plus if you're able to coordinate your visit to occur sometime between March and May, you'll at the Refuge when the fawns begin to appear. Each year there are only about 45 of them born, and to witness these tiny miracles of nature will make your visit even more enjoyable and memorable.